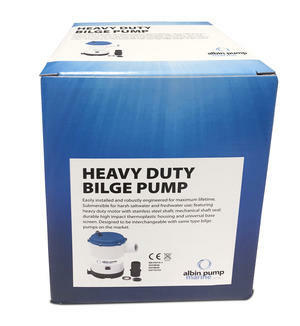 Submersible heavy duty bilge pump 24V with pump capacity 110 L/min (1750 GPH) and 85 L/min (1350 GPH) at 1m head. Stainless steel shaft, double ball bearings, mechanical seal, tough thermoplastic ABS housing and a robust long-life motor design. Universal base plate with strainer and pin (for "T-slot") to attach a level switch for automatic operation. Including check valve, 32mm (1,25") and 38mm (1,5") ports. 3A fuse. For pleasure or commercial boats above 10m (30 Ft) length. 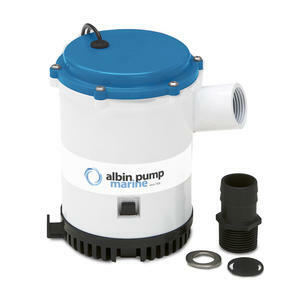 Interchangeable with Rule 1500, Johnson Pump 16084-00/32-1600-02.